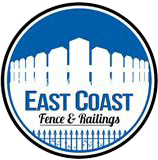 To meet the needs of our customers, East Coast Fence & Railings of Long Island provides a wide selection of fencing. This includes popular styles such as PVC, wood, aluminum, and more. We’d also love the opportunity to help you select the style that best suits you and your home. Our company has years of experience in the industry, and offers totally free estimates. When purchasing fencing, you really need to consider what you expect from a fence for your Long Island property. Luckily, East Coast Fence & Railings has a wide variety of materials to choose from, so you’ll undoubtedly find a design that will perfectly meet your needs. Most homeowners choose to have a fence installed to make their homes look more attractive, protect children and pets from leaving the property, border a garden, or simply to have privacy from neighbors. We have materials and designs to suit each of these needs. For those looking for a more elegant look, aluminum fences do not disappoint. Aluminum Fences are often selected for their aesthetic appeal. Moreover, they also require very little maintenance. However, many homeowners tend to select wood for their Long Island fencing choice, mainly because of how popular it has remained over time. Wood also tends to be the ideal material to choose for privacy fences. Although wood requires more maintenance due to its vulnerability to corrosion, it tends to have many different color options. This is because of the wide variety of stains available. Wood also has a very quaint, traditional look. For Long Island fencing, we offer many contemporary options such as PVC fencing, which is becoming very prominent in the industry. PVC is extremely durable and has a smooth surface, which makes it a great option for protecting children and pets. It’s no wonder that this type of fencing is gaining in popularity on Long Island. Its other numerous benefits include long-lasting color, U.V. protection, and a non-toxic surface. Chain-link and pool fences are also options that we have available. Chain-link is a great fencing choice for Long Island commercial properties, especially for factories. It’s a durable material that can take damage; however, it’s also simple to replace. Meanwhile, pool fences keep your family safe by marking off the rest of your backyard from your pool. We’ll create a design for you that will complement the design of your backyard too. Besides just fencing, we also offer gates and railings for Long Island residences. These will make your property even more beautiful while providing the functionality you need. While we work on fencing for you, we recommend having these additions installed on your Long Island home as well. An expertly installed gate is one of the best ways to protect your property. In addition, our railings offer great protection on decks, stoops, and many more structures you may have. Speak with our fully licensed and insured fencing company today! East Coast Fence & Railings can be reached at (516) 286-2236. When you talk with our Long Island professionals, we can provide you with a free fencing estimate for your project. Our company will also help you decide on what type of fence is best for your home. We promise that you’ll experience not only the best service, but also the finest quality end product when you work with us.